Who is Grace Coddington, the woman behind this fascinating memoir? Grace is the creative director of Vogue*, arguably the most influential modern fashion publication today. Her primary responsibility is styling and executing many of the fashion photo shoots that appear in the magazine each month. Anna Wintour, Vogue’s formidable editor-in-chief whose icy, composed persona inspired the Miranda Priestly character in the book and film The Devil Wears Prada, is the most visible figure associated with the brand. Grace was behind the scenes until The September Issue, a documentary that followed the Vogue staff as they created the eponymous issue in 2007, premiered in August 2008. In the film, Grace cursed when frustrated and was occasionally ornery with the filmmakers that trailed her as she worked. She was the anti-Anna. This all made her a breakout star. Although The September Issue has brought much attention to Grace, she has a long history in fashion that she recalls in this memoir. Grace’s story begins with her childhood in Wales, where she saw her family’s home used as a base for the British military during World War II. But the action starts after she moved to London to start a modeling career in the early 1960s–just as the decade started swingin’. She was one of the first to sport Vidal Sassoon’s famous five point haircut. She modeled for Mary Quant, the designer who brought miniskirts into fashion. She almost had a dalliance with Mick Jagger before the Rolling Stones hit it big. Her modeling days ended in the late 1960s after sustaining injuries in a car accident, so she took a job at British Vogue. Over the years she rose through the ranks, and eventually landed at American Vogue in 1988 when Anna Wintour became editor-in-chief. Throughout her career, Grace has collaborated with an impressive roster of photographers, designers, hairstylists and makeup artists, models and supermodels, and celebrities. She wrote about these relationships, dropping a lot of famous names. But it flows with the narrative. 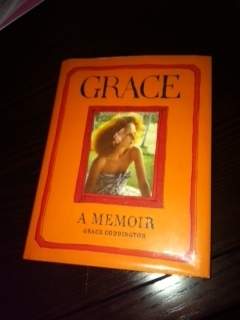 In the book Grace shared plenty of juicy anecdotes about in-fighting among Vogue editors, as well as supermodels (i.e. Kate Moss) and celebrities (i.e. Mike Tyson) behaving badly on photo shoots. My favorite story is about a model that flirted with Grace’s partner, Didier, during a shoot, and Grace expressed her displeasure by “accidentally” sticking the model with pins when adjusting her outfit. There is substance behind the style in this book. Grace wrote honestly about her two divorces and her sister’s untimely death, after which she adopted and raised her nephew. A whole chapter is devoted to her decades long friendship with Liz Tilberis, who was editor-in-chief of Harper’s Bazaar magazine (a rival to Vogue) in the 1990s. Many color photographs from Grace’s modeling career and her fashion spreads in both British and American Vogue appear throughout the book, which bring her stories to life and demonstrate her distinct romantic, British aesthetic. Grace’s original pen-and-ink illustrations of herself, her Vogue colleagues (many are featured in the book’s end papers), scenes from her life, and her cats are included throughout as well. I must mention that there is an entire chapter about Grace’s cats, past and present. She had a cat named Puff, after the rapper P Diddy–an instance of the previously mentioned name dropping. I think she loves cats more than fashion. Grace even appeared on Martha Stewart’s talk show in a segment about cats, which she recounted in the book. I enjoyed visiting Grace’s fashionable world and was sad when the book ended. Grace is witty and an engaging storyteller. Her frank tone shows that she doesn’t take herself, or her new fame, too seriously. If you’re interested in fashion, Vogue, or Grace–and even cats–this is an excellent book to check out. The September Issue is also a good complement to this book. *Stop by the Reference Department on the second floor to borrow current issues of Vogue, and other fashion magazines! 2012 back issues are also available.